* This post has been sponsored by YOXO. Over the last week we've had several rainy April days. I don't know what it is about rainy days, but after the kids have had the taste of being able to play outside, having Mom tell them that they have to stay inside seems to drive them (and Mom) a little stir-crazy. 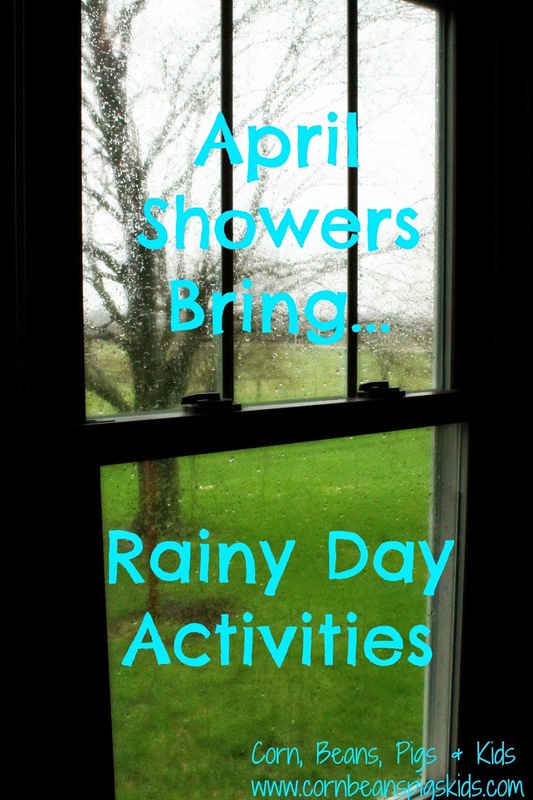 So here is a fun list of rainy day activities for your family the next time you find yourself stuck in the house. Baking - LP and MP are my two big helpers in the kitchen. They love helping me cook and bake. So on a rainy day, why not take some time and make some cookies or a pan of brownies. Make it an extra special day by having everyone put on aprons and make your child's favorite baked treat. It is also a great excuse to try a new recipe! Dress-Up - When LP turned 3 years old he got a big box of dress up clothes and props. This has been one of the best presents he's ever received. We have added to it over the years and now have fun dressing up as pirates , to cowboys with stick horses , to superheros . The kids love playing dress up! Get Crafty - A rainy day is the perfect excuse to make crafts. Over the last week's rainy days we have made handprint flowers, made rocket ships out of old oatmeal containers, and built a robot from a YOXO kit, to name a few. Our son LP loves building things and this YOXO construction kit we got at Target was easy to use and lots of fun. The cardboard pieces are Ys, Os or Xs and fit together by slits in them. Before we built the robot the kit was intended for, LP loved using his imagination and was putting the pieces together to build other robots, a house and a car. The only thing that was frustrating, was that they had a couple extra pieces in the kit to make a shield and head for the robot out of a thinner cardboard. The pieces don't stay or fit as well with the rest of the construction and we ended up just taking them off. Go Camping - That's right, go camping - inside. My kids love their tent and tunnel they got for Christmas. The only downside about the tent and tunnel is that it takes up a lot of space - but the upside is that it was perfect incentive for them to get the play room cleaned so we could put it up. Top off the camping experience with s'mores! These are just a few things we've kept busy with on our rainy days. What do you like to do on a rainy day? Remember to Comment for a Cause! You are a good mom to keep your kids entertained! We like movies, play dough, and coloring. However, this rainy weekend I did laundry and completely cleaned out my closet. Now, we have a bigger mess!